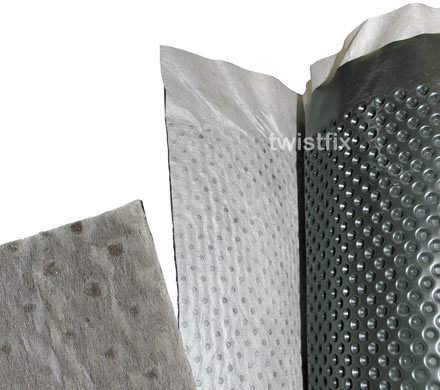 Twistfix offer tripple layer protection for new basement walls. Geotex is a multi-layered external cavity drain membrane for foundation water­pro­ofing. The three layers consist of a slip membrane for differential movement,a high density polyethylene membrane with 8mm studs which give great strength and draining capacity,and a geotextile mat to prevent oil particles or debris from blocking the cavity or drain. Prior to installing the geotex you must ensure that the structure is free from any sharp protusions and is in a reasonably sound condition.To ensure the geotex sits snugly to the horizontal slab/­foundation a triangular fillet of Floor Junction Fillet Seal is required at the junction between the horizontal slab/­foundation and the vertical structure. Apply Technoseal Damp Proof Paint (in two coats)to the structure and allow 24 hours for the Technoseal to cure. Fix the Geotex to the wall using CM Plaster Plugs at 150mm centres ensuring that the Geotex faces the soil.At the sides of the structure the CM Plaster Plugs should be within 100mm of the corner on both sides. Geotex can be fitted vertically or horizontally and the joints are sealed using CM Waterproofing Tape. The Geotex must extend to ,or just below the Aquadrain Pipe,and the pipe needs to be placed in clean Granular fill,and placed at least 150mm below the Slab Foundation/­Floor level. To finish the Geotex neatly at the top and to prevent any debris entering the cavity drain use Finishing Strips. For more information contact us on 0800 1236007, email info@twistfix.co.uk.